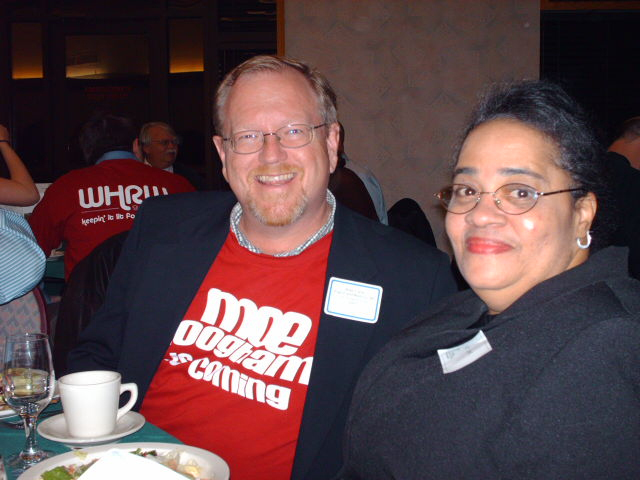 Provided by Ferdinand Montalvo Left to right: Mike Crane, general manager of WHRW from 1981-82, and Kit White, a member of the station since 1970, sit together at WHRW’s 40th Anniversary Gala. Minister Kit White, a station member at WHRW 90.5 FM since 1970, died at the age of 68 due to unknown circumstances. She was the host of WHRW’s show “Gospel Time,” which aired every Sunday morning from 9:30 a.m to noon. Originally, the show had a slow start, as White would only play her music when the music theory classes tapes broke. Since its start, the show has grown tremendously and become well-recognized by most in the Binghamton area, according to an email from Jeffrey Goldberg, general manager of WHRW and a senior majoring in geography. “Gospel Time” preceded “Apprentice Dentist,” an airtime slot used to teach station apprentices how to operate WHRW’s technology, and was dedicated to “the divine inspiration to the words and music of the black church” coming from “the most diverse station in the nation,” which she claimed at the end of every broadcast. “She was always a shining light for all of us, and always ready to help us out of a dark place, staying around as long as needed until your problems were solved,” Goldberg wrote in an email. White made an impact on many with her calming words and was willing to help anyone out of a dark place. She put enthusiasm and care into each and every one of her shows. White was able to bring a smile to her peers’ faces and her gentle character did not go unnoticed. Her friends at WHRW will miss her positive attitude and her dedication to the show. “I am so thankful to have known and talked to Kit to the extent that I did. We have lost not only a fantastic DJ with so much care and pride in her show, but also a strong and inspiring member of the Binghamton community,” Mileski wrote. A memorial service was held Sunday, May 6, on WHRW from 9:30 a.m. until 1 p.m. for anyone to share their stories about White.